On January 22nd, our newly configured vehicle set off for a drive from Montreal to Alberta. Stopping points include Toronto, Winnipeg, Regina, Calgary and Edmonton. 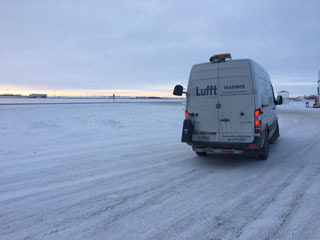 Equipped with two MARWIS sensors and on-board cameras, we're monitoring the road conditions around the Great Lakes, the Praries and the Rockies. Over 5000km of road will be monitored. Data is collected and transmitted live to our ViewMondo server.